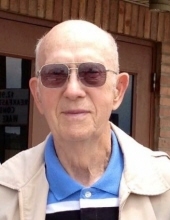 Carl E. Monesmith, 90 of Bourbon passed away on Wednesday, November 28th in Pilgrim Manor Nursing Home of Plymouth. Carl was born the son of Victor and Mabel Hepler Monesmith on April 22, 1928 at Nappanee, IN. Carl was a life long resident of the area and retired from Bourbon Foundry in 1994. He was a “jack of all trades”. Carl mowed grass. trimmed trees for over twelve years for many elderly people of Bourbon. He loved to ride bikes with his wife around town and was a huge Cubs fan! After graduating from Bourbon High School in 1946 he then served in the United States Army as a cook during the Korean War time. On September 4, 1953 he married the love of his life Ruth Reed who he has shared 65 years of marriage. He will be greatly missed by his wife Ruth; his son and his wife Richard and Susan Monesmith of Bourbon; six grandchildren: Ryan Monesmith, Cory and wife Amy Monesmith, Reed and wife Amy Monesmith, Erin and husband Adam Cleays, Eric and wife Jocelyn Erlacher and Heather Yoder. Also Carl was blessed with fifteen great-grandchildren. Preceding in death were his parents, and three brothers: Robert, LaMar and Dale. The family will receive friends on Friday, November 30, 2018, from 4:00 - 8:00 P.M. in Deaton-Clemens Funeral Home, 115 S. Main St. Bourbon, Indiana 46504. Funeral services will be Saturday, 10:00 AM December 1st at the Plymouth Community Church, 11802 Lincoln Highway, Plymouth, IN 46563 with Pastor Darek Morris officiating. Burial will follow at Pleasant Hill Cemetery, Bourbon. A grave side service will follow in Pleasant Hill Cemetery, Bourbon, Indiana. Deaton Clemens Funeral Home is privileged to be entrusted in arranging the services for the Monesmith family. Condolences may be left at deatonclemensfh.com. To send flowers or a remembrance gift to the family of Carl E Monesmith, please visit our Tribute Store. "Email Address" would like to share the life celebration of Carl E Monesmith. Click on the "link" to go to share a favorite memory or leave a condolence message for the family.